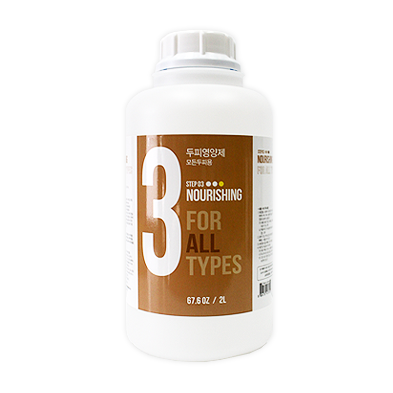 – as this product belongs to step 3 care treatment (nourishing) among three-step management program (scalp scaling-PH balancing – nourishing) of a scalp treatment shop, the product makes hair roots healthy and helps hair to grow well by nourishing nutrition to weakened hair roots directly. Once the Step 2 work (pH balancing) is completed, evenly spray to your scalp with a spray instrument as much amount, the liquid of which should not flow down, after shampooing, drying your scalp with a hair dryer, and taking about 7ml from this product container with the pipette. Then Style as usual. as this product belongs to step 3 care treatment (nourishing) among three-step management program (scalp scaling-PH balancing – nourishing) of a scalp treatment shop, the product makes hair roots healthy and helps hair to grow well by nourishing nutrition to weakened hair roots directly. The product is a product of active ingredients extracted without thermal destruction through our patented Low-Temperature Nano-Extraction Method, Seaweeds, medicinal herbs and grains as its main ingredient. It helps to maintain a healthy scalp by supplying various nutrients necessary for hair growth. Seaweeds contained in the product may contain alginic acid and iodine, an essential component of the formation of hair (keratin). Grains, such as soybean and sesame, contain a large quantity of antioxidants, etc. Thuja Orientalis leaves have antibacterial activity, and thus is good for seborrheic dermatitis. Pinus Densiflora leaves, good medicines for nerve stability, anti-aging, and cure for insomnia, have efficacy in hair growth. Once the Step 2 work (pH balancing) is completed, evenly spray to your scalp with a spray instrument as much amount, the liquid of which should not flow down, after shampooing, drying your scalp with a hair dryer, and taking about 7ml from this product container with the pipette. Although absorption time can vary depending on an amount of medicine or the ancillary equipment used, abortion time is usually 10 minutes or less. After this, you can apply either irradiation of infrared light or massage. After using this product, please don’t shampoo if possible.